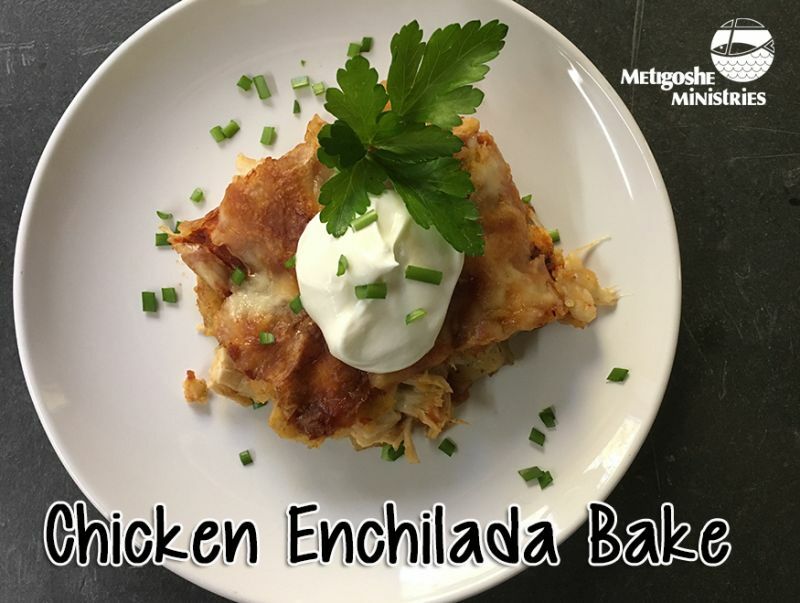 A favorite with both campers and retreaters, this layered enchilada bake can easily be made ahead and customized. I like to add corn and kale, but the sky’s the limit! Sauce: Place onion and garlic on a sheet pan and place under the broiler until well-charred, about 3-4 minutes. Alternately, preheat a cast iron on high and put the wedges of onion cut-side down until they develop charred spots. Flip to the other cut side for char to develop. Do the same with the cloves of garlic. Make sure to run an exhaust fan during either of these processes to avoid setting off the smoke detector! Preheat oven to 425 degrees. Mix together onion, garlic, tomatoes, chipotle pepper, and 1/2 cup water in a pot on the stove and simmer until the onions soften about 10 minutes. Remove from heat and puree with a handheld blender or food processor until smooth. Assembly: In a glass 9×13 pan, spread a thin layer of sauce on the bottom. Place a layer of tortillas on the sauce, cutting them as needed to fit your pan. Spread another layer of sauce on the tortillas, followed by chicken, cheese, and any add-ins. Repeat this layering several times until you have just enough sauce left to cover a top layer. Top with tortillas, sauce and cheese and bake for 20-25minutes, until the cheese browns and the middle is hot. Serve with sour cream and cilantro.